This file contains traditional Chinese festival dates from 2016 throught 2020, in a format that you can easily import into your Microsoft Outlook Calendar. My 2005-2010 and 2011-2015 files are archived and available upon request. These festivals are not the same as official government holidays, although there is some overlap. This calendar shows Confucius' Birthday on the traditional lunar dates as celebrated in Hong Kong and Macau, not on the Western calendar date of September 28th as officially celebrated in Taiwan (and under consideration in the mainland) as Teachers' Day. The Mazu Festival is mostly popular in the south, and the Laba Festival is more of a northern tradition. There are many other traditional festivals confined to smaller areas, and I encourage you add and edit as you wish using Excel. Editing instructions are below. In Outlook 2007 or later, click on the File tab, then click on "Options". 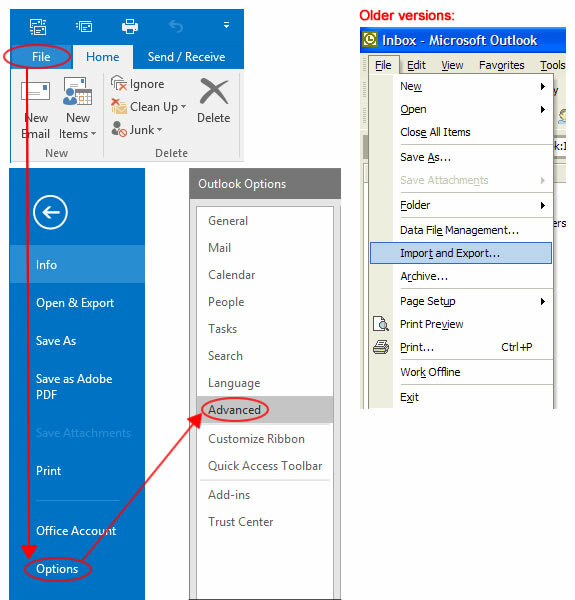 In older versions of Outlook, open the Tools menu and click "Options". These calendars will also include official government holidays — for example, Hong Kong holidays inlcude Christmas and July 1st (Hong Kong SAR Establishment Day) — in addition to traditional Chinese festivals. Be certain this is what you want. Undortunately Microsoft does not include Taiwan in that list, but you can use my download as a template to create your own importable list of holidays. Outlook also offers Chinese lunar and zodiac calendars in that same Calendar Options area. Look for "Enable an alternate calendar" to add one of those alongside the standard dates. If you want to make any changes to my file, please do so before importing. (Remember to save it again as a .csv file, not a spreadsheet.) After importing, you can remove these using my instructions below but it is tedious. For locations/holidays not included in Outlook or in my download file, you can build your own import file using my file as a template. Turn on Reminders (set "Reminder on/off" to "TRUE"). Change the date format if your PC does not use the US or EU locales I offer, so that the file will import correctly. Change Mandarin to Cantonese (like translating Chongyang Jie to "Chung Yeung"). Some may not be interested in the Mazu Festival, which is mainly celebrated in Taiwan, Macao and other southern coastal communities. Buddha's Birthday, the Laba Festival, and the lunar date of Confucius' Birthday are also more regional. You can also add more local festivals like the Monkey God Festival. Installation is just a simple "import" process. I have tested this file with Outlook 2002, 2003, 2007, 2010, 2013, and 2016 for Windows. It probably works with Mac Outlook too, with just a few differences in where to click for installation...please let me know if you try this on a Mac (preferably with just one or two lines in the file at first). Note: if your PC is not set for the US or UK date formats I have used in these files (see the "Downloads" links above), please open the file in Excel and format the date cells with your locale. Then re-save as a CSV file. In recent versions of Outlook, start at the "File" tab, select "Options", then when the Outlook Options panel appears select "Advanced". In older versions, go to the File menu and select "Import and Export..."
In recent versions of Outlook, look for an "Export" section, then click the "Export" button. I know we're not exporting, we're importing. Importing is hidden in here. I sincerely hope by the next time I come back here to update this page, some genius will have decided to add the word "Import". In older versions you'll already be at the "Import and Export Wizard". For all versions, I'm going to re-use my original screen shots here, as the rest of this is basically the same. The file should appear in the next dialog with a checkmark next to it. If there is no checkmark, click "Change Destination..." or the "Back" button to determine if you have made any mistakes in previous steps; or if you made any changes to the file it may contain errors. You should not have to click "Map Custom Fields". If everything looks OK, click "Finish". In Outlook 2002 or 2003, View > Arrange By > Current View > Events, sort by subject, then select and delete in groups. In Outlook 2007, View > Current View > Events, sort by subject, then select and delete in groups. In Outlook 2010 and later, View > Change View > List, sort by subject, then select and delete in groups. To get back to your old view, go back to Current View and select Calendar Day/Week/Month. I've imported this into Outlook 2002, 2003, 2007, 2010, 2013, and 2016, and I have synchronized with Palm, Blackberry and Android devices with good results, but please feel free to help test, improve, correct, criticize and suggest anytime via the Contact page. "Microsoft", "Windows", "Linux", "Ubuntu", "Apple", "Macintosh" and any other trademarks on this site are the sole property of their respective owners.